5 Reasons You NEED A Bamboo Cardigan!! Cardigans are one of those things that every woman has in her closet. They come in all shapes and sizes, colors, and prints. Some cardigans are better for certain body types, and others are better for certain outfits. It can get a little confusing sometimes, but wearing the right cardigan for your body type and for your outfit is important. So today let’s talk about our Bamboo Cardigan. A thoughtfully made garment designed to be remarkably versatile and flatter most, if not all, body types. Available in 4 colourways – Black, Merlot, Ivy and Timberwolf– our Bamboo Cardigan is the ultimate throw-on-and-go layer. Delightfully soft and eco-conscious, this piece features signature buttoned epaulets and exterior patch front pockets. 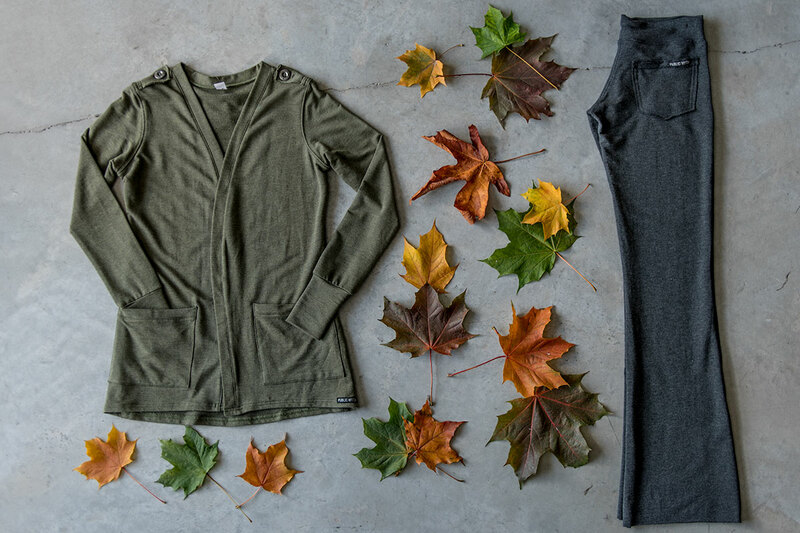 Swapping our Bamboo Cardigan in for a sweatshirt is an incredibly easy way to level up your style, all while staying just as comfortable. With one simple change, the look instantly goes from more juvenile and sloppy to more mature and put-together. Still hovering over the “add to cart” button? Here’s 5 reasons why every woman should have at least one Bamboo Cardigan in their wardrobe. 1. They can be worn year-round. Spring, Summer, Fall, Winter – cardigans work for all seasons. From being the perfect complement to a strapless or spaghetti-strap dress on a cooler summer evening to a top layer on a frigid winter day – a cardigan will keep you comfortable in multiple weather conditions. 2. They work well for and maximize every female body silhouette. No matter what body silhouette you are, a cardigan will work well for you. 3. It hides areas you may feel uncomfortable showing. If you are shy about showing off an area of your body, a cardigan is a great option to cover this area up. Including – arms, cleavage, muffin top, back acne etc. 4. They can help to dress up or down an outfit. Have an outfit that you need to dress up a bit for the office or an evening out? A perfect option is to throw a cardigan over a sleeveless blouse or dress and perhaps add on a brooch, belt or flower to embellish. It also works the other way – have an outfit that’s a bit too dressy for where you’re going? A plain cardigan will be a great option to dress it down. 5. Helps carry over other items in your wardrobe into other seasons. Example — you have a sleeveless top you love, you can extend the wear of it into winter months by throwing on a cardigan. Timeless, versatile, fashionable and practical – if you’re a woman who doesn’t own one (or a few in different colors for that matter), it’s about time you did. Shop the Bamboo Cardigan Here! !